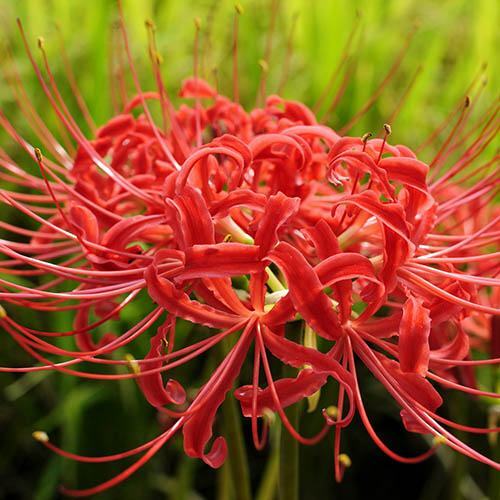 We are delighted to offer the superb Red Spider Lily (Lycoris radiata) to British gardeners! A new introduction, and a great choice for autumn colour. Despite its delicate appearance, it is very tough. Perfect en masse in 20cm diameter pots, or at the front of borders in sunny spots. Supplied as a pack of 5 bulbs size 8+, to plant into pots or garden soil straight away. We are delighted to offer the superb Red Spider Lily (Lycoris radiata) to British gardeners as a new introduction, and a great choice for Autumn colour. Despite its delicate appearance, it is very tough, thriving, in sunny well-drained spots. The gorgeous stems emerge from the soil in late Summer and Autumn, and last for several weeks in the garden or even as a cut flower, their gorgeous crimson red petals simply explode like a box of fireworks! Perfect en masse in 20cm diameter pots, or at the front of borders in sunny spots, Red Spider Lilies will add a touch of the exotic to your garden. Very low maintenance and pest free too, bulbs do benefit from winter protection as they are not tolerant of extended periods of cold. Cover bulbs with a mulch over winter, or move pots into a dry place over winter as they are not frost tolerant.